In the past year, from time to time I've noticed several interior designers sharing their work on social media and using a type of rendering which is really unique and different compared to what I typically use and see most designers use. I became curious about this type of rendering and after reading up on it, learned it's called drop-on rendering. You probably wondering what is it or what is the difference compared to other types of renderings. We will discuss about it on this blog. This is an example of drop-on rendering. Some of you guys have been following me since the early days. I discussed in an older, and one of my most read, blogs about 2D Rendering vs. 3D Rendering which described the differences between these two different types of renderings. They are the 2 most commonly used in the industry, so I'm really excited to share with you about this new one. See the image above? That is what drop-on rendering can look like. You take a really good picture of your space then you edit it in Photoshop to add items to improve the spaces look. It's kind of like a marriage between a 2D and 3D Rendering. Let me show you what it looked like before the editing. Original picture before Photoshop edits. Sometimes I get really busy with lots of e-design projects with many having the same deadline. I decided to get smarter with my work without hurting the quality of my design and or the final presentation for our client. I sometimes ask my clients for good pictures of their spaces so I can do drop-on renderings to save time. 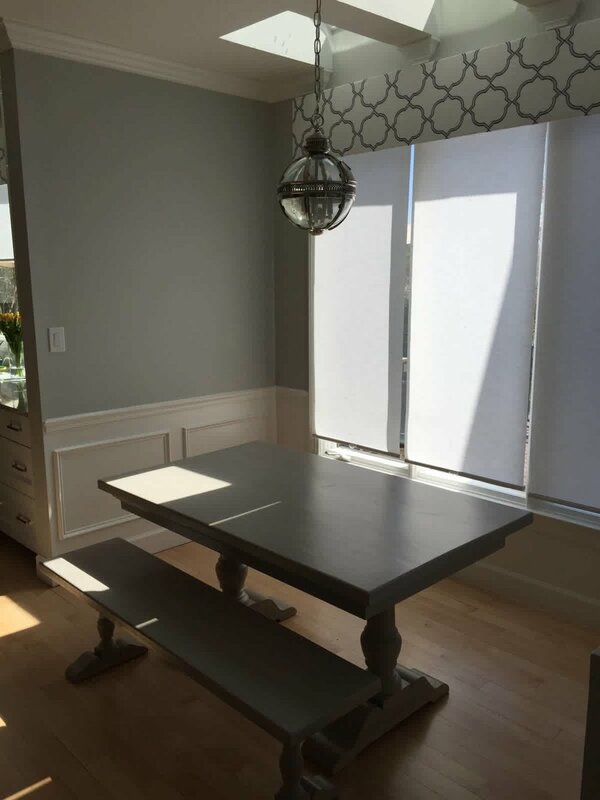 That does make a big difference for me but more importantly, it looks professional and is great for the client to envision the space before the makeover. Here are a few more examples of my other recent e-design projects that included drop-on renderings. This rendering was my first drop-on rendering work for the client. 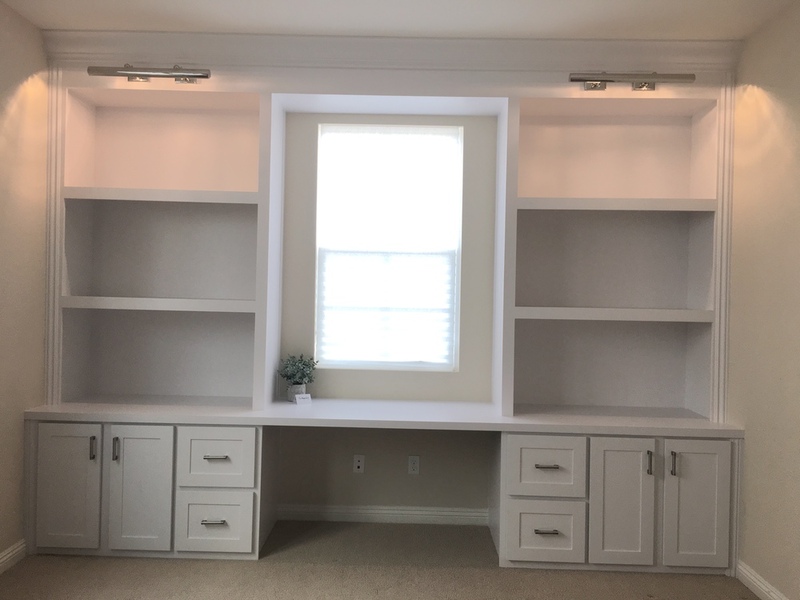 All I did was just add the wallpaper, window treatment, chair, task lamp, laptop, and accessories for the built-in shelves. Does it help you to see how you could style your built-in shelves with this type of rendering? See the outdoor living space photo? This space didn't need much work, so I added the outdoor pillows, fire, nest lounge chairs and side table to this picture. The rendering is simple but still helps the client to envision the space better. This one was a very simple e-design project request. 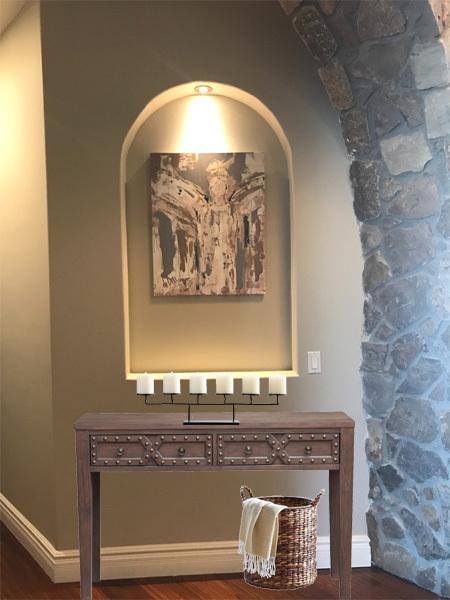 The client only wanted to see how their new console table, candles, and basket look like for their foyer before they purchased it. I only added three items to this photo to help the client to see it to make the decision and provide guidance. After doing a several drop-on rendering works - I really pleased to see how much it really help our clients to envision their spaces better. From now, I would encourage my clients to take a few good pictures of their spaces so I can do drop-on rendering works for their spaces. If quality pictures at the right angles aren't doable, then I go back to the tried and true 2D and 3D renderings. I would love to hear your thoughts on these drop on renderings.